Are Eggs Healthy for Weight Loss? Sylvie Tremblay holds a Master of Science in molecular and cellular biology and has years of experience as a cancer researcher and neuroscientist. Whether you like them scrambled, poached or over easy, eggs are welcome in many health-conscious diets. They're relatively low in calories and full of high-quality protein and other nutrients, which means they can boost your health, as well as help you shed pounds. Some egg-based dishes are high in calories and fat, however, so stick to healthier cooking methods if you want to lose weight. Eggs are naturally low in calories. Each large, whole egg has only 72 calories -- which is only 4 percent of your calorie intake if you're on an 1,800-calorie diet. If you're following a more restrictive 1,200-calorie diet, one egg will "spend" just 6 percent of your calorie "budget." That figure doesn't take into account any calories added during cooking, however. Using oil to make fried eggs ups your calorie intake to roughly 90 calories per egg, and scrambled eggs or omelets with cheese added will have more calories, too. Instead, choose cooking methods that don't require added fat such as poaching. 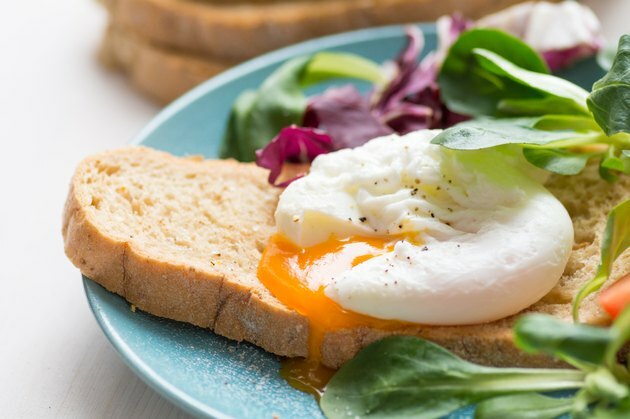 If you're currently eating 2 fried eggs each morning, simply switching to poached eggs will save you more than 13,000 calories over a year -- the equivalent of almost 4 pounds of fat. Some of eggs' health benefits -- as well as weight loss benefits -- come from their high-quality protein. Each egg contains slightly more than 6 grams of protein, made up of all the amino acids you need from your diet. Your body can use that protein to build new muscle tissue -- a bonus for weight loss, since muscle tissue burns more calories than fat. Protein also helps you feel full, explains Dr. Michelle Hauser in an interview with Harvard Health Publications, and requires more energy to digest than carbs or fat, so you'll burn more calories breaking down a protein-rich meal. Use eggs to add a protein boost to lower-protein foods for weight loss. Mash hard-boiled eggs with cottage cheese for a higher-protein "egg salad," serve poached eggs on toast or add sliced, hard-boiled eggs to a spinach salad. There's some evidence that eggs specifically help you shed pounds. One animal study, conducted at the University of North Carolina, looked at whether egg protein promoted weight loss. The study authors fed rats one of two types of high-protein breakfasts -- one made up of egg protein, and one with wheat protein -- and found that rats who ate the egg breakfast ate less for the rest of the day. That signals that egg protein might be more filling some than other types of protein, which might help you control overeating. A human study, published in the International Journal of Obesity, also found that eggs might help you lose weight. The researchers fed overweight or obese patients either an egg breakfast or a bagel breakfast as part of a calorie-controlled diet. They found that people who ate eggs for breakfast on a weight loss diet lost more weight than the people who ate bagels, and they also lost slightly more body fat. However, the researchers found no difference between the egg and bagel groups when study participants were allowed to eat as much as they want. So while eggs may accelerate your weight loss, you'll still need to restrict calories to shed body fat. The versatile nature of eggs makes them convenient to include in your diet, which offers a potential weight loss benefit, since you're more likely to stick to a plan that doesn't require endless hours in the kitchen. You can eat hard-boiled eggs as a snack, include sliced eggs in your turkey sandwich, or poach eggs in noodle soups and broth for a higher-protein soup. Eating eggs before your workout might also help you lose weight. One study, published in the Journal of Science and Medicine in Sport, found that eating a high-protein snack before cardiovascular exercise boosts your calorie burn more than if you eat a lower-protein snack. Try an egg on a small slice of whole-grain toast for a high-protein snack, to fuel your workout and help you banish fat. How Much Fat Is in a Hard Boiled Egg?